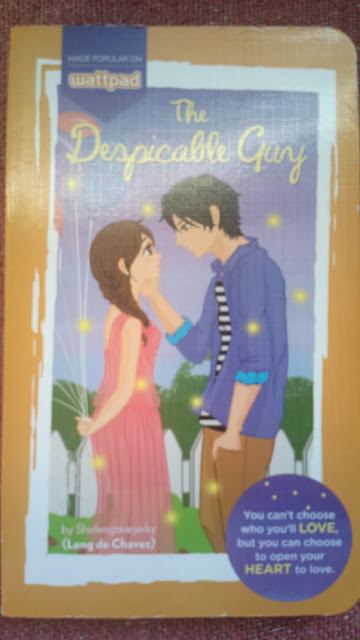 Shirlengtearjerky or Leng de Chavez’ Scribd novel The Despicable Guy can well be titled as this entry’s title since the story is not just about him but about her as well. I’m talking about the characters Jersey Benitez Santiago and John Kevin Uy Santos. I have a like and dislike relationship with this book. To start with, every chapter will have you fall in love with both characters and their love story as well despite the fact that they were initially at odds with each other. That’s a formula that’s quite common among Wattpad borne stories. Their romance at least smoothly transitioned from enemies to friends, then close friends, and finally lovers. The pacing was ideal although it kinda drifted fast after Jersey’s 18th birthday. It was fast forward to the next year and then to their graduation. The momentary parting of our lovers at the closing chapters reminded me of Operation: Break the Casanova’s Heart. But unlike that book which extended towards the main characters engagement and the heroine’s pregnancy, the ending was lacking for this book. It would have been better if Jersey’s response to Kevin’s out of the blue marriage proposal was followed all the way to Germany. Two points of views is but healthy, Kevin and mostly Jersey. I’ve read a raw Wattpad story, continuation of a published book actually but no need to mention the title, where the author had used almost practically all characters to narrate the story. It’s a mess seeing everything from everyone’s point of view actually. Also, although every other character is special, their contribution towards the development of the main character’s story should be the sole focus, like in this book, where nobody stole the limelight from Kevin and Jersey. They were stars from start to finish. I’ve read one in Wattpad where every character’s biography was unappealingly expounded. I enjoyed the playlist as well. Although we can’t literally hear the songs, they’re playing in my head while reading lyrics. It’s something Pop Fiction (Summit Books) publications are known for. There is also a bookmark featuring the book cover. I believe that adding this freebie started with the novel The Bet. There are quite minor issues but I noticed them nonetheless. It would be understandable considering the fact that most books of this type extends to a year or even longer in updates so the authors may have missed a few details. In Kevin’s letter to Jersey during her 18th birthday, he mentioned about seeing her playing Guitar Hero in an arcade but didn’t recall it at one of the early chapters. Also, Kevin can drive a car but not a motorcycle? It does happen but rarely, most especially for a guy. All in all, the book still served its purpose – fall in love! Hi there! I also liked this story since it's something realistic. It's not the type where the main characters fall in love at once. Series of events happened before they became a couple, right? Not even a touch of a fairy-tale type of story. With regards to the different POVs, I sorta agree with you. But, for TDG, I think having Jersey and Kevin's POV used is pree okay. After all, they are the lead roles here, right? Besides, having the other members of the group put into spotlight (esp about their lovelives) makes the story more interesting. ^Wow, thanks for sharing the link. I really hoped for a book 2 coz I wanted to know what happens after eh. No problem! Oh the book 2 is more exciting. :D All in all, it's a really good story because it transitions from their college life to their careers. It'll encompass the maturity and a much more development of the story. ^Ayt, I'll go ahead and read it. Di ko pa masyado nabasa. Yung start pa lang.